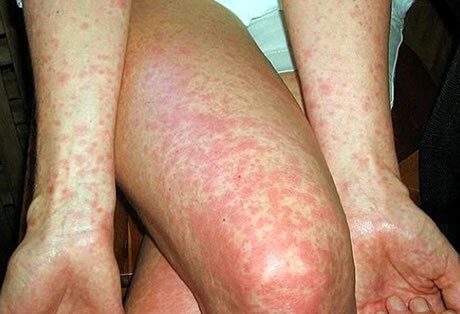 Scarlet fever is an infection caused by a streptococcus bacterium. It can be transmitted through the air or by physical contact and primarily affects children between four and eight years of age. In temperate climates, scarlet fever is most common during the late fall, winter, and early spring. Scarlet fever is characterized by a sore throat,a fever of 103–104°F (39.4–40°C), and a sandpaper-like rash on reddened skin. If scarlet fever is untreated, such serious complications can develop; as rheumatic fever (a heart disease) or kidney inflammation (glomerulonephritis). Scarlet fever, or scarlatina, gets its name from the characteristic flush of the patient’s skin, especially on the cheeks. Fever and sluggishness accompany a sore throat and raised rash that progressively covers much of the body. Symptoms usually begin within two to five days after a person is exposed. The fever usually subsides within a few days, and recovery is complete by two weeks. After the fever is gone, the skin on the face and body forms flakes, with the skin on the palms of the hands and soles of the feet peeling more dramatically. Scarlet fever is highly contagious when the patient is in the early stages and is not being treated with antibiotics. It is spread by sneezing, coughing, or direct contact with an infected person. Early in the twentieth century, severe scarlet fever epidemics were common. As of the early 2000s, the disease is rare, partially because of the availability of antibiotics. However, antibiotics are not the entire reason, since the decline began before their widespread use. One theory is that the strain of bacteria that causes scarlet fever has become weaker over time. Scarlet fever is caused by Group A streptococcal bacteria (Streptococcus pyogenes). In addition to causing scarlet fever, Group A streptococci bacteria cause many different illnesses, such as strep throat, wound or skin infections, pneumonia, serious kidney infections, and toxic shock syndrome. The strain of streptococcus that causes scarlet fever is slightly different from the strain that causes most strep throats. The scarlet fever strain produces an erythrogenic toxin, which is what causes the skin to turn red. The main symptoms and signs of scarlet fever are fever, sluggishness, sore throat, and a bumpy rash that blanches (turns white) when it’s pressed. The rash appears first on the upper chest and spreads to the neck, abdomen, legs, arms, and in folds of skin such as under the arm or in the groin. The skin around the mouth tends to be pale while the cheeks are flushed. In children, the disease causes a “strawberry tongue,” in which inflamed bumps on the tongue rise above a bright red coating. Strawberry tongue is rarely seen in adults. Finally, dark red lines (called Pastia’s lines) may appear in the creases of skin folds. A medical practitioner must diagnose and treat scarlet fever. The doctor notes the symptoms and eliminates the possibility of other diseases. Measles is a viral infection that is also associated with a fever and rash. 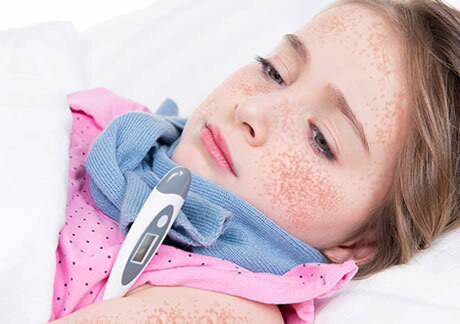 However, scarlet fever can be distinguished from measles by the quality of the rash, the presence of a sore throat in scarlet fever, and the absence of the severe eye inflammation and runny nose that usually accompany measles. Because scarlet fever may begin with a sore throat, the doctor will first determine if the problem is bacterial or viral in nature by checking for specific symptoms. For example, inflammation of the lymph nodes in the neck is typical in strep infections but not viral infections. On the other hand, cough, laryngitis, and stuffy nose tend to be associated with viral infections rather than strep infections. Laboratory tests are necessary to make a definitive diagnosis of a strep infection and to distinguish a strep throat from a viral sore throat. One test that can be performed is a blood cell count. Bacterial infections are associated with an elevated white blood cell count. In viral infections, the white blood cell count is generally below normal. A throat culture can distinguish between a strep infection and a viral infection. A throat swab from the infected person is brushed over a nutrient gel containing red blood cells (a sheep blood agar plate) and incubated overnight. If streptococcal bacteria are present in the sample, they will break down the red blood cells and leave a clear zone in the gel surrounding the bacteria. The doctor will also distinguish between a strep throat and scarlet fever. In a strep infection, the throat is sore and appears beefy and red. White spots appear on the tonsils. Lymph nodes under the jaw line may swell and become tender. These symptoms may or may not be present with scarlet fever. The main feature that distinguishes scarlet fever from a strep throat is the presence of the sandpapery red rash. Because of the nature of the infection and the danger of serious complications, scarlet fever cannot be treated solely with alternative therapies. A course of antibiotics and treatment by a physician is imperative. However, alternative therapies may be used to relieve the symptoms of fever and sore throat. For fever, especially in children, there are some alternative treatments. Naturopathy recommends sponging with tepid water if the fever rises over 102°F (38.9°C). Rest and plenty of water are advised. Homeopathy treats the specific type of fever, so it will be necessary to consult with a homeopath to determine the correct remedy for the patient. Aconite 6c at the onset of fever that is accompanied by thirst, chills, dry burning skin, and restlessness. Belladonna 6c for high fever with dry burning skin, red face, dilated pupils, and swollen glands. Arsenicum album 6c for patients who are restless and agitated, alternately hot and cold, thirsty, and patients whose fever is worse after midnight. Byronia 6c for the patient who is shivery and sweating, very thirsty at long intervals, and having headaches and pain. Ferrum phosphoricum (iron phosphate) 6c for a mild fever of slow onset accompanied by frequent bouts of sweating, shivering, and headaches. Western herbalism may be used to treat fever, but treatment requires a qualified medical herbalist. The herbalist may recommend a bath with tepid infusions of limeflower, elderflower, yarrow, or German chamomile. Herbs such as catnip, hyssop, lemon balm, and vervain can lower the temperature and increase perspiration. German chamomile, lavender, and limeflower promote relaxation, and echinacea and garlic fight infection. Chinese herbs in combinations can treat specific patterns of fever. They can also be used to balance the energies, specifically the yin (cool and moist) energies after the illness subsides. Aromatherapy, in which the patient gargles with water and very small amounts of geranium or tea tree essential oils. A massage using diluted eucalyptus oil may also be helpful. Naturopathy may suggest fasting to eliminate toxins and the use of garlic to fight infection. Naturopaths will also recommend fruit juices high in vitamin C, especially citrus fruit juices, to soothe irritation. Hydrotherapy, in which water is utilized to restore health, uses humidifiers to prevent the irritation of a sore throat by dry air. A practitioner may also recommend using a cold abdominal pack and throat compress to stimulate both circulation and the immune system. Western herbalists will recommend gargling with an infusion of antiseptic herbs such as calendula or sage, and may use echinacea to fight infection. Although the symptoms of scarlet fever often clear within a few days, the patient should receive antibiotic treatment to reduce the severity of symptoms, prevent complications, and avoid spreading the infection to others. Antibiotics may be taken either orally or by injection. After a patient has been on antibiotics for 24 hours, he or she is no longer contagious. The rash itself is not contagious. Antibiotic treatment will shorten the course of the illness in small children but may not do so in adolescents or adults. Nevertheless, a full course of treatment with antibiotics is important for preventing complications. Since penicillin injections are painful, oral penicillin may be preferable. If the patient is unable to tolerate penicillin, alternative antibiotics such as erythromycin or clindamycin may be substituted. The patient must take the entire course of medication—usually 10 days—for the therapy to be effective and to ensure that the bacteria have been killed. Because symptoms subside quickly, there is a temptation to stop therapy prematurely. However, not completing the medication increases the risk of developing rheumatic fever and kidney inflammation. If the patient is considered too unreliable to take all of the pills or is unable to take oral medication, daily injections of procaine penicillin can be given in the hip or thigh muscle. After the contagious period has passed, the patient does not need to be isolated. Bed rest is not necessary. Aspirin or Tylenol (acetaminophen) may be given for fever or pain relief. If the patient is treated promptly with antibiotics, full recovery can be expected. Patients who have had scarlet fever develop immunity to the disease and cannot be infected again. However, about 10% of children don’t respond to an initial antibiotic treatment, so it may be necessary for a second throat culture and the use of a different antibiotic. Although scarlet fever is only contagious before treatment with antibiotics is begun, it is wise to avoid exposure to children at any stage of the disease. Doing so will help prevent the spread of scarlet fever.